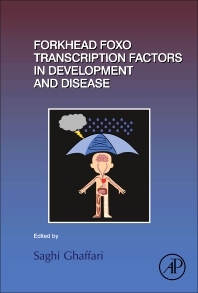 Forkhead FOXO Transcription Factors in Development and Disease, Volume 127, the latest release in the Current Topics in Developmental Biology series, provides a comprehensive set of reviews on transcription factors FOXO and their various functions in health and disease. Each chapter is contributed by a leading expert in the field, with specific sections covering Exceptional Longevity: Insights from Hydra to Humans, FOXO in neural cells and diseases of the nervous system, maintaining the equilibrium for better or for worse, and The Role of FoxOs in Bone Health and Disease, amongst other topics. This compilation provides a unique, up-to-date view of this enigmatic, highly evolutionary conserved family of transcription factors with a diverse array of functions in aging and longevity, cancer, and metabolism. Dr. Saghi Ghaffari is a Physician Scientist and Professor at Icahn School of Medicine at Mount Sinai (ISMMS). Her research is on mechanisms implicated in blood production and disorders of blood. Her work has been partly focused on FOXO transcription factors and their contributions to the healthy blood formation. She has been trained in Medicine in Paris, France, obtained her PhD in Vancouver, Canada and further training at the Whitehead Institute for Biomedical Research at MIT in Cambridge, USA. She has been at the ISMMS since 2003.